John Gonzalez and Amy Sherman of MLive and "Behind the Mitten" visit on of their favorite places in Michigan -- Mackinac Island. This time they record from Original Murdick's Fudge, which is open during the holidays and shipping fudge all over the country .... just in time for the holidays. John and Amy talk to owner Bobby Benser Jr. about the special packages of fudge available for the holiday season. John and Amy talk to Andrew Doud of ... See More Doud's Market on Mackinac Island, which is considered the oldest grocery store in America. 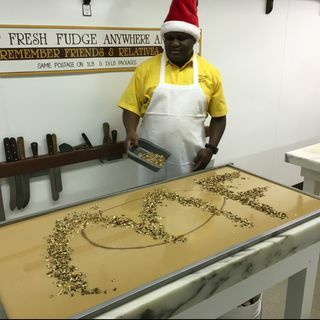 Bobby Benser returns to the show with his master fudge maker Carnel Samuels, who is originally from Montego Bay, and is a longtime employee at Original Murdick's Fudge. It his 13th season on Mackinac Island. Andrew Doud and Bobby Benser return to talk about memories of growing up on Mackinac Island and upcoming events.